After a year-long process, the BIA now has a master plan to guide public realm improvements within their boundaries. Composed by DTAH, a local landscape architectural firm, the master plan is a significant and exciting step forward to ensure the St. Lawrence continues to grow as a vibrant and dynamic neighbourhood. This document provides an overall vision for the neighbourhoods public spaces, one that can be implemented by private and public investment. It endorses roadway and streetscape improvements in addition to a sustainable public space network that can act as a catalyst for private development and to support a vibrant and dynamic neighbourhood. 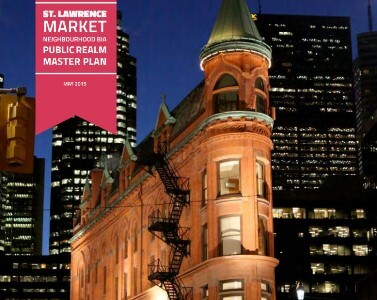 This public realm plan will inform the BIA’s position on the future of St. Lawrence Market Neighbourhood’s public realm. It conceptually illustrates a number of improvement projects that the BIA could become involved with and support. This plan will also identify potential project scheduling and possible partners to deliver the various improvements. We have also recently commissioned a Master Plan with the Laneway Project for Farquhars Lane. You can find the results of that master plan here. Check out our Spring/Summer 2018 Newsletter for upcoming events and developments in the neighbourhood. For general and visitor information about the St. Lawrence Market neighbourhood, we invite you to visit our consumer website OldTownToronto.ca.